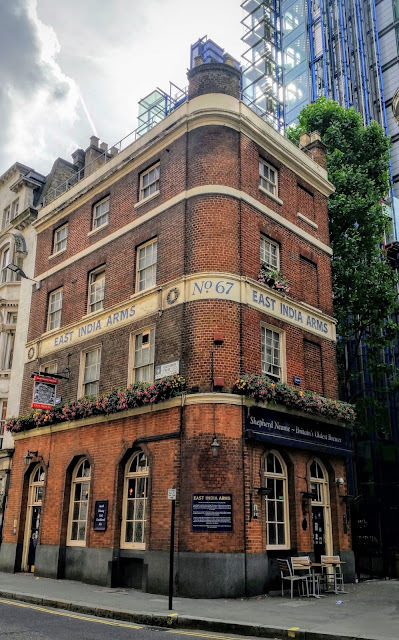 Built in 1829, as part of a block of Georgian style buildings, the East India Arms is believed to stand on the site of the Magpie Ale House, which traded from at least the mid 1600s. The pub takes its name from the British East India Trading Company, whose premises were located next door. There is a plaque on the outside that details the history of the British East India Trading Company and, considering their offices didn't close until the 1850s, there is every chance that employees visited the pub. The pub itself, with its wooden floor, bar stools but no tables and old photos hung on the walls, retains a traditional feel and is a must-see on any visit to the area.